(Nanowerk News) Imagine that you want to find out from a single picture taken of the front of a house, what the building looks like from behind, whether it has any extensions or if the brickwork is damaged, and how many rooms are in the basement. Sounds impossible? Not in the nanoworld. Scientists from Jülich and Xi’an have developed a new method with which crystal structures can be reconstructed with atomic precision in all three dimensions. Admittedly, they did not use a picture from a simple digital camera to perform this feat, but rather an image from an ultra-high resolution electron microscope. The process is also especially suitable for the spatial mapping of radiation-sensitive samples, which would be quickly destroyed by the high energy measurement beam. 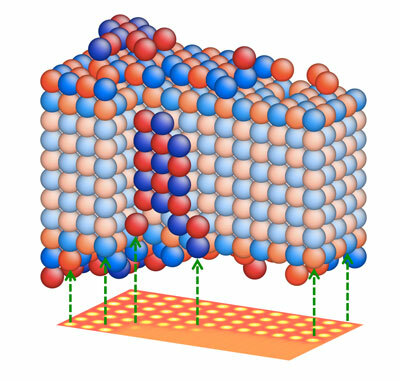 The results have been published in the current edition of the scientific journal Nature Materials ("Determination of the 3D shape of a nanoscale crystal with atomic resolution from a single image"). An important characteristic of nanoparticles is that they differ from other kinds of materials in that their surface determines their physical and technical properties to a much larger extent. The efficiency of catalysts, for instance, depends predominantly on the shape of the materials used and their surface texture. For this reason, physicists and material scientists are interested in being able to determine the structure of nanomaterials from all angles and through several layers, right down to the last atom. Until now, it was necessary to perform a whole series of tests from different angles to do so. However, scientists at Forschungszentrum Jülich, the Ernst Ruska-Centre for Microscopy and Spectroscopy with Electrons (ER-C) and Xi’an Jiaotong University in China have now succeeded for the first time in calculating the spatial arrangement of the atoms from just a single image from an electron microscope. Their approach offers many advantages; radiation-sensitive samples can also be studied, which would otherwise be quickly damaged by the microscope’s high-energy electron beam. The comparatively short data acquisition time involved could even make it possible in the future to observe the transient intermediate steps of chemical reactions. Moreover, it enables a "gentle" measurement procedure to take place, to detect not only heavy but also light chemical elements, such as oxygen, which has an important function in many technologically significant materials. "Acquiring three-dimensional information from a single two-dimensional image seems impossible at first glance. Nevertheless, it is in fact possible; we don’t obtain a simple two-dimensional projection of the three-dimensional sample as the experiment follows quantum mechanical principles instead", explains Prof. Chunlin Jia, researcher at the Jülich Peter Grünberg Institute, in Microstructure Research (PGI-5), the ER-C and at Jiaotong University. "On its way through the crystal lattice, the electron wave of the microscope acts as a highly sensitive atom detector and is influenced by each individual atom. The key point is that it does actually make a difference whether the wave front encounters an atom at the beginning or at the end of its pathway through the crystal." For the new 3D measuring process, a thin crystalline sample – in this case, magnesium oxide – is positioned in the microscope so that the atoms at the intersections of the crystal lattice lie exactly on top of one another, forming columns along the observation axes. These atom columns are later only visible as bright spots on the microscopic image. A special imaging mode is used to improve the signal-to-noise ratio. In this way, subtle variations are visible, which show the researchers the location of individual atoms in the columns along the beam direction. To reconstruct the spatial structure, the scientists compare the image with calculations made on a computer. The computer simulations give an impression of how a microscopic image of a perfectly flat magnesium oxide crystal would look. After this, they match up the model crystal step by step until the reconstructed figure corresponds optimally with the image from the electron microscope. In order to verify the uniqueness of the results achieved, the scientists performed extensive statistical tests. These showed that the method is not only sensitive enough to detect each individual atom, but also to differentiate between the magnesium and oxygen elements of the crystal.